All gussied up in its pretty purple bow. 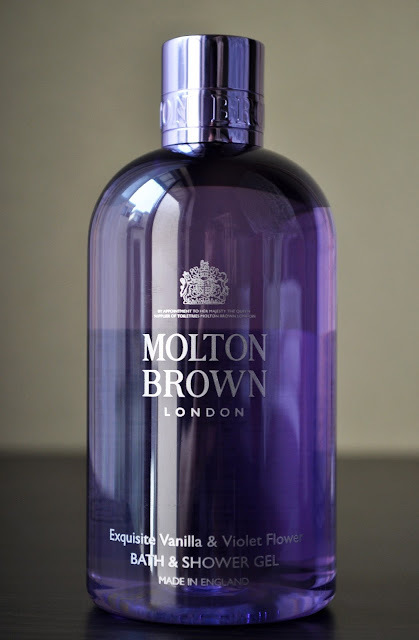 The Vitalising Vitamin AB+C Bath & Shower Gel (commented on here)was the first Molton Brown product I tired,and, let's just say, I wasn't impressed. With every season, there are certain scents I gravitate towards. But, my everlasting love, no matter what time of the year (and in no particular order) are Lavender, Bergamot (Earl Grey), and Violet. 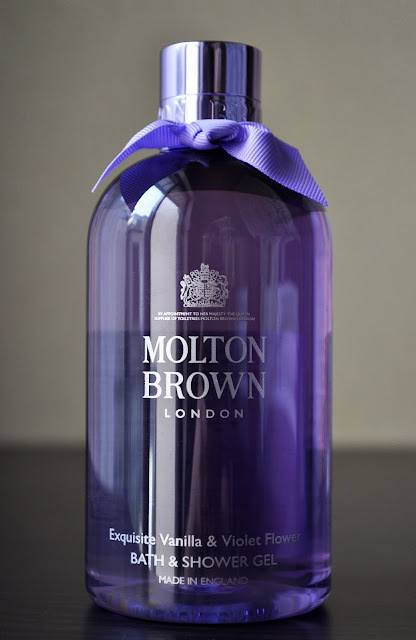 Purchased through Isetan's Online Store, I had to try the limited edition Molton Brown Exquisite Vanilla & Violet Flower Bath & Shower gel. List of the notes: (Top Notes) Freesia, (Heart Notes) Orris, (Base Notes) Vanilla, (Extract) Violet. I was very pleased with the shower gel's rich lather, and how lovely it felt. My skin feels great, and the scent last for several hours. Among all the notes, the dominate fragrance is the violet, and I love that. However, I will say this, I feel the Exquisite Vanilla & Violet Flower Bath & Shower gel would be best suited for Fall or Winter because the vanilla base gives a warmth to the scent (that I do like), but as it's getting warmer, the fragrance is becoming a little to strong for the month of May. If the Exquisite Vanilla & Violet Flower Bath & Shower gel is still available during the colder seasons, I will definitely repurchase.